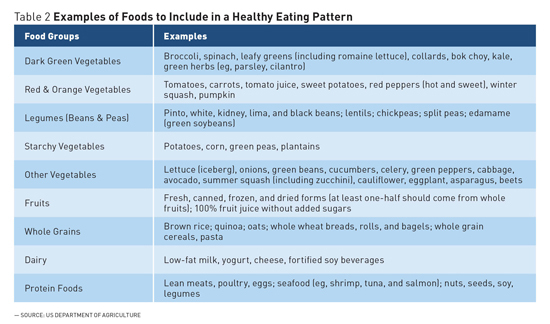 Based on the newly developed 2015–2020 Dietary Guidelines for Americans, experts offer recommendations on dietary patterns designed for optimal nutrition among older adults. Every five years for the last 35 years, the US Department of Agriculture (USDA) and the National Institutes of Health have chosen a committee of experts to review the scientific evidence regarding diet, nutrition, and health among Americans. This process, referred to as Dietary Guidelines for Americans (DGA), provides a scientific report that serves as a foundation for public health policy and guides regulations that will ensure access to a safe and healthy food supply. Furthermore, the guidelines provide a foundation for healthy aging (See Table 1) and serve as a starting point for those reaching the sixth decade of life and beyond. In addition to utilizing public health guidelines to orchestrate a healthy dietary pattern, the authors appreciate that aging is associated with a greater risk of many acute and chronic illnesses that require very specific and personalized dietary and nutritional interventions. It is critical that the health care team utilize the expertise of trained experts, registered dietitians (RDs) or registered dietitian nutritionists (RDNs), to assist providers in developing personalized recommendations for common diseases such as diabetes, hypertension, dyslipidemias, and obesity. The following information will highlight some of the key messages of the new DGA 2015–2020 that are particularly relevant to the aging population. In addition, the authors discuss some of the prevalent nutritional deficiencies that practitioners must address in their elder patients. Obesity increasingly plagues the aging population and promotes many diseases of aging, impacts mobility, reduces quality of life, and adds to health care expenditures.5,6 Older adults have decreased caloric needs and a reduced metabolism, making them susceptible to weight gain. Thirty-seven percent of adults aged 60 and older are categorized as overweight (body mass index [BMI] of 25–29.9 kg/m2) or obese (BMI ≥30 kg/m2).7 Common chronic diseases of aging promoted by obesity include osteoarthritis, heart disease, diabetes, and many types of cancer.5,6 The causes of the obesity epidemic are multifaceted and involve both complex individual genetic, biologic, and behavioral factors that are impacted by societal changes in lifestyle, the built environment, and the food industry. Among the different methods used to identify obesity, calculating BMI (weight in kg/height in m2) remains the most simple. BMI does not differentiate between lean and fat mass but is quick and can be useful in addition to clinical judgment. The most accurate tools to assess body composition are dual-energy X-ray absorptiometry (DEXA), CT, and MRI,9 but these tests are often cost prohibitive and unnecessary. The Healthy US-Style Eating Pattern of the DGA recommends 5½-ounce equivalents of protein foods per day at the 2,000-calorie level, while the Healthy Mediterranean-Style Eating Pattern and Healthy Vegetarian Eating Pattern recommend 6½- and 3½-ounce equivalents of protein foods per day, respectively. Some studies have reported potential benefits of higher protein intakes for older adults; however, more research is needed to provide more precise guidance. Presently, it is imperative that the current recommended intake is met with high quality meat or vegetable protein and is coupled with routine exercise to suppress, slow down, or reverse the process of sarcopenia. Clinical assessment of body composition is typically adequate.14,15 Measures of physical function can be combined with clinical assessment and imaging studies. These measures are not routine in most medical clinics but are strongly related to decreased morbidity16 and the risk of falls. 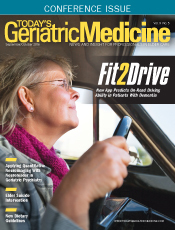 Performance-based measures of physical function include a four-meter gait speed test, hand grip strength, and lower extremity muscle power.14 Validated questionnaires (eg, Activities of Daily Living questionnaires)17 and assessing self-reported measures of physical function are additionally useful.18 A review of dietary habits by an RD can help ensure older adults are consuming adequate protein for optimizing muscle mass and physical performance. Dietary fiber is a term for complex carbohydrates, largely of plant origin, that are not completely digested by human digestive enzymes. Although there are many different types of fiber, they are generally classified into two categories: soluble and insoluble. Vegetables and whole grains contribute the largest amount of fiber in the USDA Food Patterns. Fruits also provide a substantial amount of fiber.24 The DGA recommends at least one-half of all grains be consumed as whole grains. Complaints of persistent constipation may indicate a dietary pattern low in fiber. Dietary fiber assessment is best completed by an RD using a thorough dietary recall. Because there are many different types of dietary fiber, a varied diet replete in fruits, vegetables, and whole grains is ideal, but a fiber supplement can be useful. Calcium is the most abundant mineral in the body and is critical for healthy bone formation and renewal, nerve transmission, and intracellular signaling.26,27 Vitamin D plays an essential role in optimally regulating calcium homeostasis and can be synthesized in the skin in response to sunlight.28 Vitamin D and calcium work together to maintain the health of bones and other tissues. Vitamin D is essential for the host to absorb and metabolize calcium and is increasingly linked to diverse health outcomes related to cognition, immune function, and muscle performance.28 The skin produces vitamin D in response to sunlight; thus, older adults are at a greater risk for deficiency because of their limited sunlight exposure coupled with a reduced dietary intake.37,38 The prevalence of inadequate vitamin D status, as defined by a blood test (25-hydroxy-vitamin D of <20 ng/mL) ) among adults over the age of 60 has been estimated to be between 30% and 50%.39,40 A chronic deficiency reduces bone mineralization28 and may increase fracture risk.34 The recommended dietary allowance of 600 IU/day (serum 25OHD concentration of 15 ng/mL or 37.5 nmol/L) has been established for adults aged 51 to 70 and 800 IU/day (serum 25OHD concentration of 20 ng/mL or 50 nmol/L) for adults over the age of 70.34 The number of vitamin D–rich foods is rather limited (fatty fish, fortified dairy products, and ready-to-eat cereals), so a dietary supplement is reasonable for those at risk of inadequate intake. It has long been appreciated that vitamin A plays a key role in eye health and remains a major health issue in developing nations. A growing body of evidence provides a plausible role for the carotenoids lutein and zeaxanthin, which both accumulate in the human lens47,48 and may provide protection by reducing light-initiated oxidative damage.48,49 Adequate intake of antioxidant nutrients vitamin E and vitamin C as well as omega-3 fatty acids are being investigated to improve eye health, but more evidence-based consensus to define optimal intake is required. In general, studies support the role of lutein and zeaxanthin in preventing AMD, though after diagnosis, benefits of carotenoid supplementation studies are less consistent. Rich sources of dietary lutein and zeaxanthin are found in green leafy vegetables such as kale, collard greens, and spinach. Ongoing research will allow expert committees to evaluate the potential benefit lutein and zeaxanthin have on eye health in order to establish possible Dietary Reference Intakes for these carotenoids. The 2015–2020 DGA provides recommendations based on current scientific and medical knowledge that aim to promote overall maintenance of good health and prevention of disease. The DGA is designed to focus on foods and dietary patterns that promote health for all individuals aged 2 and older, and it also serves as a basic framework for healthy aging. For aging individuals with specific diet-related concerns, it is advisable to obtain nutrition support from RDNs for a thorough dietary assessment and personalized treatment plan. — Qi Hui Wong is a student in the division of medical dietetics of the School of Health and Rehabilitation Sciences at the Ohio State University in Columbus. — Elizabeth Grainger, PhD, RDN, is a nutrition researcher in the Laboratory of Nutrition and Cancer Prevention at the Ohio State University Comprehensive Cancer Center. — Steven K. Clinton, MD, PhD, is a medical oncologist at the Ohio State University James Cancer Hospital. A program leader in the Ohio State Comprehensive Cancer Center, he served on the 2015–2020 US Dietary Guidelines Advisory Committee. 1. US Department of Agriculture, US Department of Health and Human Services. 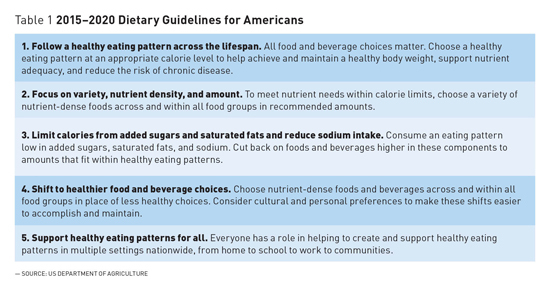 2015–2020 Dietary Guidelines for Americans. 8th ed. Washington, D.C.: US Government Printing Office; 2015. 2. Rehm CD, Penalvo JL, Afshin A, Mozaffarian D. Dietary intake among US adults, 1999-2012. JAMA. 2016;315(23):2542-2553. 3. Martinez Steele E, Baraldi LG, Louzada ML, Moubarac JC, Mozaffarian D, Monteiro CA. Ultra-processed foods and added sugars in the US diet: evidence from a nationally representative cross-sectional study. BMJ Open. 2016;6(3):e009892. 4. Park S, Xu F, Town M, Blanck HM. Prevalence of sugar-sweetened beverage intake among adults — 23 states and the District of Columbia, 2013. MMWR Morb Mortal Wkly Rep. 2016;65(7):169-174. 5. Clinical guidelines on the identification, evaluation, and treatment of overweight and obesity in adults — the evidence report. National Institutes of Health. Obesity Res. 1998;6(Suppl 2):51S-209S. 6. Pi-Sunyer X. The medical risks of obesity. Postgrad Med. 2009;121(6):21-33. 7. Flegal KM, Carroll MD, Kit BK, Ogden CL. Prevalence of obesity and trends in the distribution of body mass index among US adults, 1999-2010. JAMA. 2012;307(5):491-497. 8. American Heart Association Taskforce on Practice Guidelines, Obesity Expert Panel. Executive summary: guidelines (2013) for the management of overweight and obesity in adults. Obesity. 2014;22(Suppl 2):S5-S39. 9. Hu F. Measurements of adiposity and body composition. In: Obesity Epidemiology. New York, NY: Oxford University Press; 2008:53-83. 10. Sakuma K, Yamaguchi A. Sarcopenic obesity and endocrinal adaptation with age. Int J Endocrinol. 2013;2013:1-12. 11. Baumgartner RN, Koehler KM, Gallagher D, et al. Epidemiology of sarcopenia among the elderly in New Mexico. Amer J Epidemiol. 1998;147(8):755-763. 12. Gaffney-Stomberg E, Insogna KL, Rodriguez NR, Kerstetter JE. Increasing dietary protein requirements in elderly people for optimal muscle and bone health. J Am Geriatr Soc. 2009;57(6):1073-1079. 13. Phillips SM, Chevalier S, Leidy HJ. Protein "requirements" beyond the RDA: implications for optimizing health. Appl Physiol Nutr Metab. 2016;41(5):565-572. 14. Calvani R, Marini F, Cesari M, et al. Biomarkers for physical frailty and sarcopenia: state of the science and future developments. J Cachexia Sarcopenia Muscle. 2015;6(4):278-286. 15. Rubbieri G, Mossello E, Di Bari M. Techniques for the diagnosis of sarcopenia. Clin Cases Miner Bone Metab. 2014;11(3):181-184. 16. Woods JL, Iuliano-Burns S, King SJ, Strauss BJ, Walker KZ. Poor physical function in elderly women in low-level aged care is related to muscle strength rather than to measures of sarcopenia. Clin Interv Aging. 2011;6:67-76. 17. Katz S. Assessing self-maintenance: activities of daily living, mobility, and instrumental activities of daily living. J Am Geriatr Soc. 1983;31(12):721-727. 18. Dupuy C, Lauwers-Cances V, Guyonnet S, et al. Searching for a relevant definition of sarcopenia: results from the cross-sectional EPIDOS study. J Cachexia Sarcopenia Muscle. 2015;6(2):144-154. 19. Gropper SS, Smith JL. Fiber. In: Advanced Nutrition and Human Metabolism. 6th ed. Belmont, CA: Wadsworth, Cengage Learning; 2013:111-136. 20. Slavin J. Fiber and prebiotics: mechanisms and health benefits. Nutrients. 2013;5(4):1417-1435. 21. Marlett JA, McBurney MI, Slavin JL, American Dietetic Association. Position of the American Dietetic Association: health implications of dietary fiber. J Am Diet Assoc. 2002;102(7):993-1000. 22. McGill CR, Birkett A, Fulgonii III VL. Healthy Eating Index-2010 and food groups consumed by US adults who meet or exceed fiber intake recommendations NHANES 2001-2010. Food Nutr Res. 2016;60:29977. 23. Institute of Medicine. Dietary Reference Intakes for Energy, Carbohydrates, Fiber, Fat, Fatty Acids, Cholesterol, Protein, and Amino Acids. Washington, D.C.: The National Academic Press; 2002:339-421. 24. Office of Disease Prevention and Health Promotion, US Department of Health and Human Services. Scientific Report of the 2015 Dietary Guidelines Advisory Committee. 25. Reicks M, Jonnalagadda S, Albertson AM, Joshi N. Total dietary fiber intakes in the US population are related to whole grain consumption: results from the National Health and Nutrition Examination Survey 2009 to 2010. Nutr Res. 2014;34(3):226-234. 26. Hoy MK, Goldman JD. Food Surveys Research Group dietary data brief no. 13: calcium intake of the U.S. population. http://www.ars.usda.gov/SP2UserFiles/Place/80400530/pdf/DBrief/13_calcium_intake_0910.pdf. Published September 2014. 27. Institute of Medicine. Ross AC, Taylor CL, Yaktine AL, Del Valle HB, eds. Overview of Calcium Dietary Reference Intakes. Washington, D.C.: The National Academies Press; 2011:35-74. 28. Institute of Medicine. Ross AC, Taylor CL, Yaktine AL, Del Valle HB, eds. Overview of Vitamin D Dietary Reference Intakes. Washington, D.C.: The National Academies Press; 2011:75-124. 29. Calcium. US Department of Health & Human Services website. https://ods.od.nih.gov/factsheets/Calcium-HealthProfessional/. Updated June 1, 2016. Accessed July 14, 2016. 30. Ioannidis G, Papaioannou A, Hopman WM, et al. Relation between fractures and mortality: results from the Canadian Multicentre Osteoporosis Study. CMAJ. 2009;181(5):265-271. 31. Handout on health: osteoporosis. National Institutes of Health website. http://www.niams.nih.gov/health_info/bone/osteoporosis/osteoporosis_hoh.asp. Updated February 2016. 32. Position statement. American Academy of Orthopaedic Surgeons website. http://www.aaos.org/CustomTemplates/Content.aspx?id=5604&ssopc=1. Accessed July 21, 2016. 33. Cauley JA, Danielson ME, Greendale GA, et al. Bone resorption and fracture across the menopausal transition: the Study of Women's Health Across the Nation. Menopause. 2012;19(11):1200-1207. 34. Institute of Medicine. Ross AC, Taylor CL, Yaktine AL, Del Valle HB, eds. Dietary Reference Intakes for Adequacy: Calcium and Viamin D Dietary Reference Intakes. Washington, D.C.: The National Academies Press; 2011:345-402. 35. Weaver CM. Calcium. In: Erdman JW, McDonald IA, Zeisel SH, eds. Present Knowledge in Nutrition. 10th ed. Wiley-Blackwell; 2012:434-446. 36. Institute of Medicine. Ross AC, Taylor CL, Yaktine AL, Del Valle HB, eds. Dietary Reference Intakes for Adequacy: Calcium and Viamin D Dietary Reference Intakes. Washington, D.C.: The National Academies Press; 2011:479-512. 37. Holick MF, Chen TC. Vitamin D deficiency: a worldwide problem with health consequences. Am J Clin Nutr. 2008;87(4):1080S-1086S. 38. Nair R, Maseeh A. Vitamin D: the "sunshine" vitamin. J Pharmacol Pharmacother. 2012;3(2):118-126. 39. Forrest KY, Stuhldreher WL. Prevalence and correlates of vitamin D defiency in US adults. Nutr Res. 2011;31(4):48-54. 40. Yetley EA. Assessing the vitamin D status of the US population. Am J Clin Nutr. 2008;88(2):558S-564S. 41. Feskanich D, Willett W, Colditz G. Walking and leisure-time activity and risk of hip fracture in postmenopausal women. JAMA. 2002;288(18):2300-2306. 42. Vitamin D. National Institutes of Health website. https://ods.od.nih.gov/factsheets/VitaminD-HealthProfessional/. Updated February 11, 2016. 43. Vishwanathan R, Johnson EJ. Eye Disease. In: Erdman JW, McDonald IA, Zeisel SH, eds. Present Knowledge in Nutrition. Wiley-Blackwell; 2012:939-981. 44. Klein R, Chou CF, Klein BE, Zhang X, Meuer SM, Saaddine JB. Prevalence of age-related macular degeneration in the US population. Arch Ophthalmol. 2011;129(1):75-80. 45. Congdon N, O'Colmain B, Klaver CC, et al. Causes and prevalence of visual impairment among adults in the United States. Arch Ophthalmol. 2004;122(4):477-485. 46. Chou R, Dana T, Bougatsos C, Grusing S, Blazina I. Screening for Impaired Visual Acuity in Older Adults: A Systematic Review to Update the 2009 US Preventive Services Task Force Recommendation. Rockville, MD. 2016. 47. Delcourt C, Korobelnik JF, Barberger-Gateau P, et al. Nutrition and age-related eye diseases: the Alienor (Antioxydants, Lipides Essentiels, Nutrition et maladies OculaiRes) Study. J Nutr Health Aging. 2010;14(10):854-861. 48. Roberts JE, Dennison J. The photobiology of lutein and zeaxanthin in the eye. J Ophthalmol. 2015;2015. 49. Johnson EJ. Nutrition and the aging eye. In: Bales CW, Ritchie CS, eds. Handbook of Clinical Nutrition and the Aging Eye. New York, NY: Humana Press; 2009:99-120.